Chairman Stephen Thompson insists Dundee United are determined to keep their young squad together this summer. 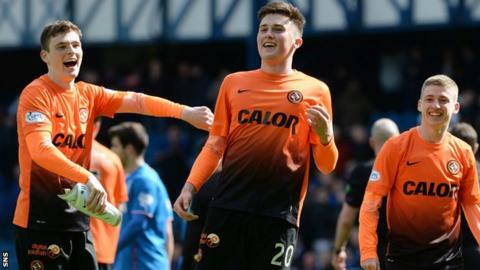 Teenagers John Souttar and Ryan Gauld have shone this season for United, who reached the Scottish Cup final with a 3-1 win over Rangers. And Thompson has no intention of selling the club's talented kids. "Unless it's an exceptional offer we want to keep the team together. That's what we intend to do as a board," he said on BBC Radio Scotland. "We refinanced the club back in February and are in a far different position from what we were. We don't have the bank breathing down our necks anymore and getting to a cup final takes the pressure off as well." Souttar and Gauld agreed new contracts in November, while Andrew Robertson, 20, also extended his terms last year, just months after arriving from Queen's Park. Midfielder Stuart Armstrong, 22, committed himself to the club until 2016 in December, while Nadir Ciftci, also 22, has another year to run on his deal, as does 23-year-old winger Gary Mackay-Steven. Defender Gavin Gunning, 23, and midfielder Ryan Dow, 22, are out of contract in the summer and the club are in talks to retain the duo. The Tangerines, who last lifted the Scottish Cup in 2010 after a 3-0 win over Ross County at Hampden, face St Johnstone in this year's final on 17 May at Celtic Park. And Thompson is relishing another appearance in Scottish football's showpiece. "There's a buzz around the club, there's no doubt about that. It's fantastic to be in another final and we are all looking forward to it," he added. "We've got a good young team and it's exciting to watch. "It's great seeing some of the young kids and you forget just how young some of them they are, Souttar is only 17 and Gauld is 18. It's remarkable how young they are and and they're going to play in a final, it's fantastic."